Kicking up a cloud of concrete dust, tunnel-boring machine “Brenda” punched through the north wall of the future Roosevelt Station on Tuesday — keeping Sound Transit on track to open its Northgate light-rail extension by 2021. The breakthrough was supposed to happen before 9 a.m., but the machine slowed down while chewing through soil laced with concrete grout, to add stability near the station vault. Shortly after 11 a.m., Brenda took a break to cool off, before proceeding at no more than 5 millimeters per minute. But overall, the dig went smoothly, said Rick Capka, Sound Transit construction manager for the Northgate line. In fact, it reached speeds of up to 100 feet a day, he said. “There’s been no real problems with the soil and ground conditions so far. The machine’s done well,” he said. Meanwhile across town, the Highway 99 tunnel machine “Bertha” — which is cutting a tunnel seven times the size of the light-rail tube — awaits repairs after stalling in December 2013 near the waterfront. 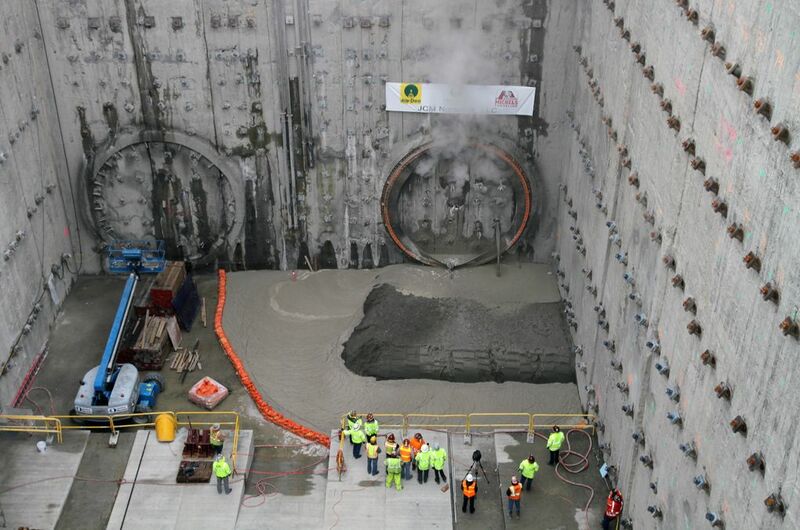 Seattle Tunnel Partners is expected to hoist up a piece of Bertha’s outer shell on Wednesday, followed by two more shell lifts and then the huge cutter drive assembly, a 4-million-pound pick. Sound Transit machine Brenda will next be pushed forward on jacks, to re-enter the ground at the south end of Roosevelt Station, and onward to the university. Its partner machine, called Pamela, will reach Roosevelt this summer, Capka said. Capka said perhaps the most challenging part lies just ahead — to dig cross-passages called adits between the twin tubes, for maintenance and emergency access. During the Capitol Hill Tunnel project in 2013, the soil broke at Montlake and water poured into a cross passage, requiring six months of groundwater pumping. That tunnel will open to trains in early 2016, connecting Westlake Station, Capitol Hill, and the University of Washington.